Posted by Prasanna Parvathaneni on Friday, October 31, 2014 in Informatics / Big Data, News. The Digital Imaging and Communications in Medicine (DICOM) standard has allowed wide-scale interoperability between medical imaging devices allowed for construction of large-scale radiological imaging system. The DICOM standard provides for extensive structured meta-data ranging from the physical dimensions of the imaging data to patient military status. Moreover, “private” fields are permitted to store almost any additional data within DICOM datasets. These alternative fields are often used to store key acquisition parameters for new or emerging imaging sequence or assist interpretation of manufacturer specific settings. While DICOM provides for interoperability, there is ample room for interpretation or use of alternative coding strategies (e.g., storage of 3-D data in a light box array or as separate DICOM slices). Hence, interpreting DICOM data is a substantial process and can be manufacturer specific. The image processing research community has gravitated towards simpler but more explicit standardized research formats — first Analyzeand Minc, and more recently NIfTI. Converting between data formats (known as transcoding) — either between files or between files and an internal memory representation — is a constant concern for software engineers and image processers (Figure 1). In medical imaging, it is critical that real-world orientation (e.g., right/left) and distances are preserved. Some image acquisitions have physical indications to allow orientation to be verified (e.g., using vitamin E capsules as fiducial markers in MRI), but these practices are inconsistent across sites. Software engineers have verified performance with the data that they have had available which can be limited in terms of manufactures and software release. Given typical research budgets, only data representative of current users is generally available and testing is difficult. Herein, we propose the “Rosetta bit” project to provide an open data resource to facilitate inter operability testing for image conversion in research software. The Rosetta bit provides a set of anonymized DICOM images along with validated conversion of the images into research file formats. The validation step consisted of using different visualization tools such as MIPAV, Slicer, SPM, etc… to check the orientation (e.g., left-right) of the converted data (Figure 1). This project specifically does not promote any particular converters, but rather encourages the data sponsor to use whatever methods they can validate for their data. Once the data have been correctly converted, others can test their preferred tools. We envision the Rosetta project as an evolving entity to which users can submit validated converted image sets and encourage software developers to support consistent image interpretation across data formats. A small logo can be used to designate that a software program has been tested with a specific release of the data resource. To test the converter, one developer can convert the raw data in the Rosetta bit project into his preferred converted format and validate it with the version present in the project. The contributors of the Rosetta bit project have provided a series of structural brain images. The initial database (Table 1) is a release of data from 4 different devices: GE SignaHD Excite, Siemens Trio, Philips Intera, and Philips 3T Achieva. All the data have been converted into NIfTI. The database provides 3D and 4D NIfTI. Many of the datasets were contributed to the public domain along with the MRIcron utilities; these data were converted with dcm2nii. 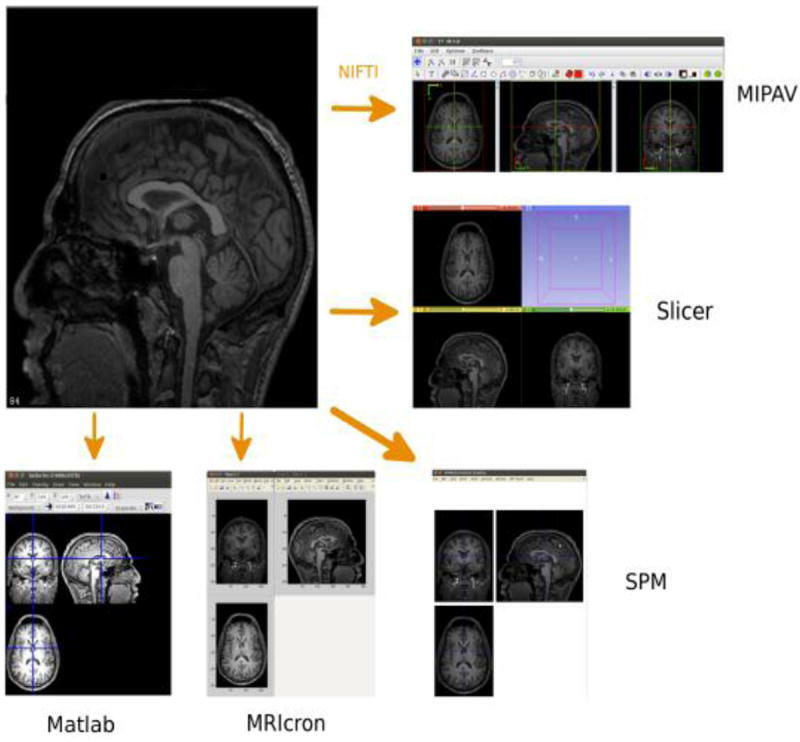 The Philips 3T Achieva dataset has been converted from DICOM to Philips PAR/REC and then from PAR/REC to NIFTI with r2agui (http://r2agui.sourceforge.net/). For all the data, the conversion from 4D NIFTI to 3D NIFTI used the SPM function spm_file_split. The data in the project has been manually anonymized using the software DicomBrowser (http://nrg.wustl.edu/software/dicom-browser/).